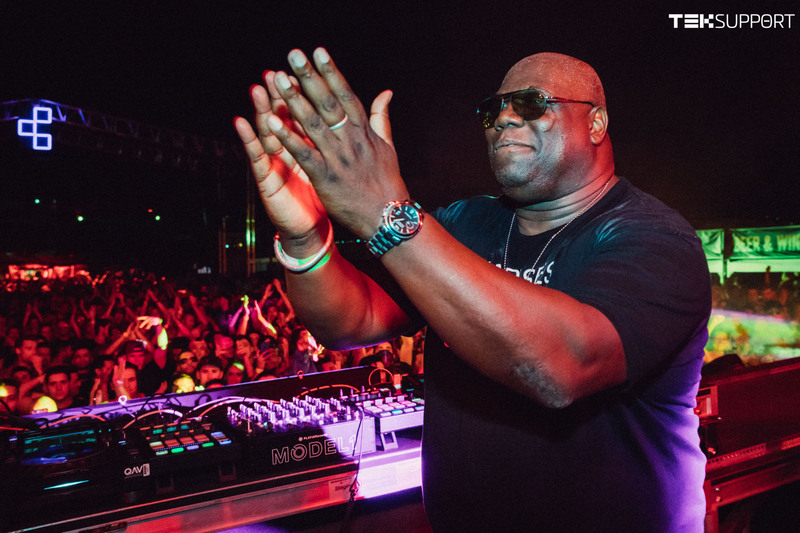 This past Saturday, electronic music legend Carl Cox brought the most blissful underground techno sounds to the musically enamored city of Brooklyn, New York. Presented by Teksupport, the completely open-air event allowed attendees to feel as if they were at many of the prestigious music festivals and venues the king of techno is known to perform at such as Tomorrowland, Ultra Worldwide, and the grand Ibiza nightclubs. The entire event felt like a mini music festival, in which we simply danced the night away under majestic New York City skies and witnessed the striking sunset turn to night while listening to some of the most inspiring techno sounds known to the electronic dance music world. From the event’s peak hour at 5 PM on a 75 and sunny Brooklyn afternoon, stimulating opening sets from Avision, Frankie Bones, and Dense & Pika set the ground for what the rest of the night had in store for us. Every single producer completely destroyed the stage during their turn under the spotlight, and spread the most incredible vibes throughout the entire crowd. Right at 9 PM, a wild Carl Cox appeared (wearing his trendsetter black techno t-shirt of course), and eagerly introduced what the next three hours were about to bring. To say the least, three hours of pure techno is not enough when it’s coming from such a musical mastermind like Mr. Cox himself. Luckily, roughly around 12:15 AM, the crowd went absolutely insane when the techno legend shouted into the mic and announced: “Brooklyn, I’m going to be playing longer for you guys, your energy is incredible!” Oh yes, oh yes. This was definitely a set that needed to be extended, as we did not want this soul-filling and inspiring moment to come to an end. The entire night was absolutely spectacular, and everything that every true electronic music lover and Carl Cox fan would ever hope for and more. Brooklyn is no Ibiza, but from the tremendous amount of pure soul and genuine energy that Carl Cox transmitted onto the crowd, it was obvious that the king of techno wanted to give us his all and allow us to feel that powerful techno heat just as anyone attending any of his overlooked sets would. Carl, thank you for allowing us to experience such an unforgettable evening and inspiring us with your soulful techno sounds. Until next time!